We’ve examined BioElements LightPlex MegaWatt Skin Brightener, that is a product designed to brighten the skin. It has an antioxidant rich formula that evens out the skin tone for a hydrated and luminous look. This product is designed to decrease the appearance of hyperpigmentation discoloration and UV damage. We’ve taken a very close look at this product and examine the relevant features to determine how it compares with its competitors. The first ingredient is pharmaceutical grade skin brightener. The next 6 ingredients are plant extracts that are alpine and contain a number of compounds that reduce color intensity in the skin. Alpha arbutin is a more natural skin lightener that inhibits the enzymes that are responsible for producing melanin, the pigment that causes hyperpigmentation. Ergothioneine is a very powerful antioxidant which prevents chemical damage to the skin. It reduces inflammation from inside and outside sources which prevents the effects of accelerated aging. Vitamin B5 helps the skin to retain moisture and provides a sort of soothing sensation to it. The last ingredient, the green tea extract, is rich in all sorts of nutrients and especially in antioxidants. Apply the product to the entirety of your face after cleansing it. There should be done once in the morning and once at night. To optimize the functionality of this product it is suggested to wear a sun protection factor product during the day. 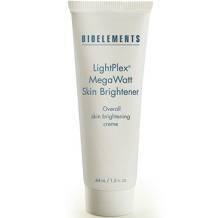 $68.50 will get a customer 1.5 fl oz of BioElements LightPlex MegaWatt Skin Brightener. The customer can sign up to receive emails from the manufacturer and they will get $10 off their first purchase as long as that purchases over $50. Orders from this manufacturer do not generally include shipping and taxes but this one qualifies because it is over $35. If a customer finds themselves unsatisfied with a product purchased directly from the manufacturer then they may return it within 30 days from the order date to receive a refund. It is not clear if this policy extends to products that have already been opened. Because the guarantee is from 30 days of purchase the customer will have to lose a few days due to delivery and then they can only try the product for a short amount of time. Such guarantees should be longer to allow customers to try the product fully. The collection of ingredients in this product should work well together apart from the fact that there is one rather artificial ingredient which is not very well characterized in biochemical databases. The price of this product is a bit steep although shipping is free. We find the price to be a little bit high because the discounts that the manufacturer offers are not as significant as what other manufacturers offer and the guarantee is also only valid for a very short time. It is for these reasons that we believe other products are superior to this one.